If it’s geysers you’re after, then here’s where you need to be heading. 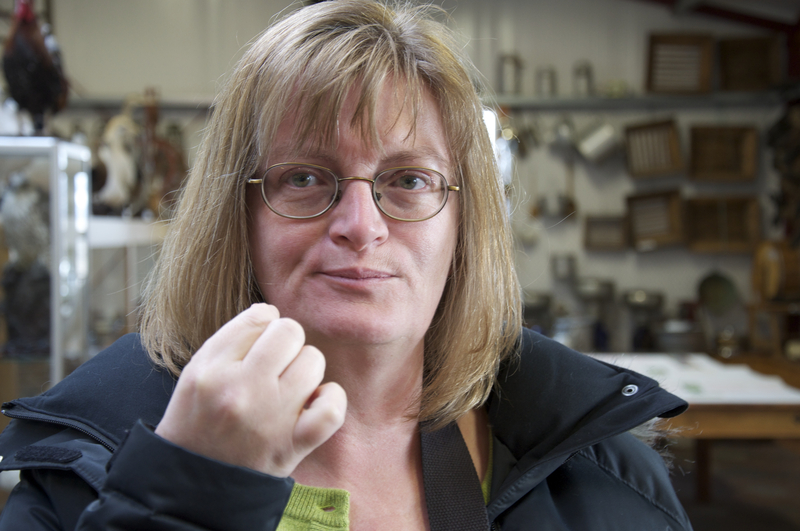 The original, in name at least, can be found a short distance from the country’s capital Reykjavik. The original geyser, Geysir, has decided it’s had enough, but Strokkur puts on a show every few minutes delighting those who visit. It’s easily accessible as part of the Golden Circle tour, or if you prefer to go it alone, then download my Unanchor Kindle guide from the UK Amazon site here: http://www.amazon.co.uk/Iceland-Unanchor-Travel-Guide-self-drive-ebook/dp/B017SDBNE8/ref=sr_1_8?s=books&ie=UTF8&qid=1452095658&sr=1-8. For a small country, New Zealand packs in a lot of geothermal sights, from other-worldly Craters of the Moon to photogenic Orakei Korako. But for sheer wow factor, then join the crowds watching Pohutu, located in the Te Whakarewarewa Thermal Valley on the outskirts of Rotorua to see the jet of boiling water shoot high into the sky. El Tatio geyser field might not have the dramatic gushers of Iceland or New Zealand, but it has atmosphere in spades. It’s essential to crawl out of bed in the middle of the night (don’t overdo it on the pisco the night before like I did) but watching the sunrise illuminate the steaming geysers is well worth the effort. I couldn’t blog about geysers and leave out Old Faithful. It’s been drawing the crowds at Yellowstone National Park for as long as the park’s been in existence and has had its name since 1870. It erupts on average 50 metres into the air about every 90 minutes or so; check the ranger’s board on arrival to see when the next show is expected. Kamchatka’s Valley of Geysers has the second largest concentration of geysers in the world after Yellowstone, packing over ninety of them into a 6km long valley. It’s difficult to reach, and therefore expensive, but it’s a trip that’s on my ever-growing bucket list. You too? Flights with Icelandair, the national carrier, depart from London Heathrow to Keflavik (KEF) the airport nearest to the Icelandic capital Reykjavik. It’s also possible to use Reykjavik as a stopover destination on your way to North America, making it possible to combine an Icelandic break with a trip to New York, for example. BA’s Cityflyer hops over from London City and BA itself operates to Reykjavik from London Heathrow. Budget airlines also serve Keflavik. WOW air flies daily from London Gatwick, easyJet offer a good service from London Luton as well as flights from London Gatwick. All of the above are non-stop flights and take a little over 3 hours. The simplest and cheapest way to get to Reykjavik is to use the FlyBus. This bus will take you from the airport to either the bus station or to a wide range of hotels. To find out whether yours is served, see this list from the FlyBus website: https://www.re.is/flybus/flybusplus – check Google maps if yours isn’t listed to identify which listed hotel is closest. Single fares to the bus station are 2700 ISK (about £19) and to your hotel 3300 ISK (about £23.50). The journey takes 45 minutes, there’s free Wi-Fi on board and tickets are flexible, so if your plane is late, you just take the next available bus. If you are travelling as a larger group or further afield, you may prefer to hire a car. There are several car hire companies at the airport. Note that you’ll need special insurance if you plan to drive off road or on some of the interior’s gravel roads (the latter are closed during the winter anyway). If you’ve chosen not to hire a car, then have a look at the publicity materials branded “Iceland on your own” which provide information on how to get around using buses run by Reykjavik Excursions. Many of the country’s major destinations are served, the notable exception being the Snæfellsnes peninsula in the west. You pay just for transport, passes are available and you pay your entrance fees when you reach your chosen destination as and where appropriate. A map showing summer bus routes can be found here: https://www.re.is/media/iceland-on-your-own/IOYO_Full.jpg. In summer, Reykjavik Excursions run an extensive range of day trips from Reykjavik incorporating all the main tourist attractions of the south and west of the country. The Icelandic capital is charming and a good base for the first time visitor. Pay a visit to the unusual Hallgrímskirkja church; it’s only 400 ISK to go up it and take in the views of the city. Also great for the views though a little out of the centre is Perlan; it has a good but expensive revolving restaurant which is popular but a bit of a tourist trap. I preferred the Icelandic Gourmet Feast at Tapas Barinn, seven courses featuring puffin, minke whale and lamb for 7990 ISK (about £57, but it will be the best £57 you’ll spend on food during your stay) – every one of them mouth-wateringly delicious. Check it out for yourslef on their website here: http://www.tapas.is/en/Menu/Icelandic_gourmet/ The area around Tjörnin lake is worth a stroll if the weather’s good; it’s not far from the main drag and is popular with joggers. 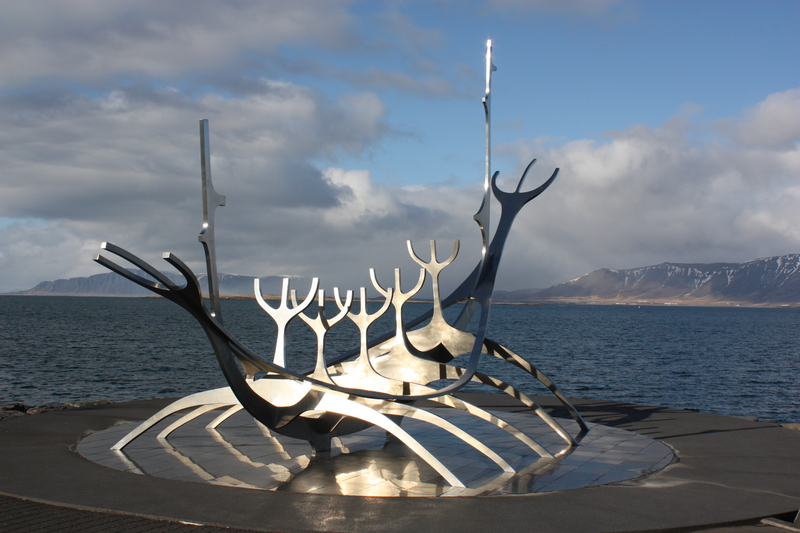 Down by the harbour there’s a cool structure known as Sun Voyager or ‘Sólfar’ which is worth making the effort to visit; walk past Harpa, the city’s concert hall and along to the Old Harbour for a pleasant walk. In the opposite direction, you’ll come to Höfði House where Reagan and Gorbachev met in 1986 to begin the process of ending the Cold War. It is possible to do your sightseeing on organised tours if you do not wish to drive and there are a number of day trips that depart from the capital. These are my suggestions for what to visit outside Reykjavik, covering the area of South and West Iceland. Expensive but unique, this spa consists of a large pool fed by geothermally-heated water. It’s possible to book massages and other treatments. There’s also a bar if you’d like a drink whilst relaxing in the warm water. Pots of white silica-rich mud are yours to try out – spread it on your face and body for an enriching treatment. Tip: in cold weather, turn left on your way out and enter the pool indoors before swimming out – it’s warmer than making a run for it from the main door. It’s possible to visit the Blue Lagoon on your way to or from Keflavik airport and lockers large enough to take a suitcase are available. 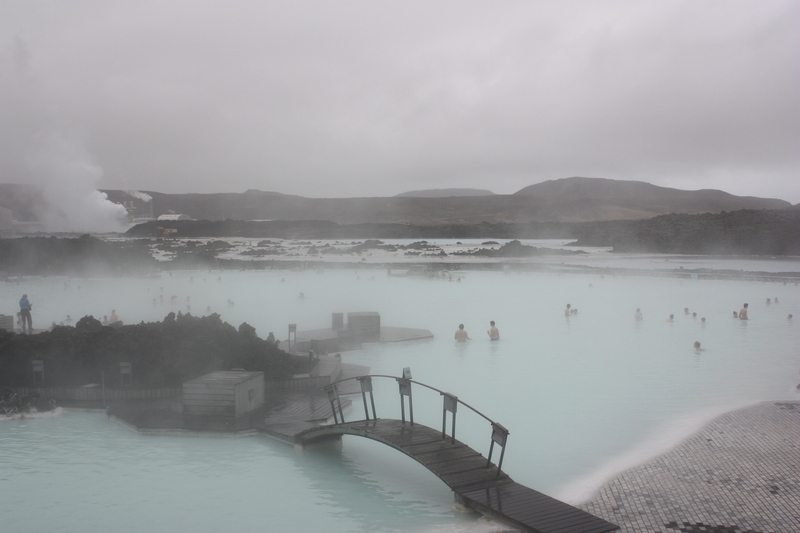 The Blue Lagoon is situated on the Reykjanes peninsula where the North American and European plates meet. With your own transport you can stand on a bridge that straddles the two – but be warned, it’s one of the windiest places in the country. The Golden Circle comprises three of Iceland’s most awe-inspiring attractions: Gullfoss waterfall, Haukadalur and Þingvellir, the site of the original Icelandic parliament. One of Iceland’s many dramatic waterfalls, Gullfoss is the spot where the Hvítá river rushes south and plunges into a chasm where the water explodes into a maelstrom of white water and eroded rock. 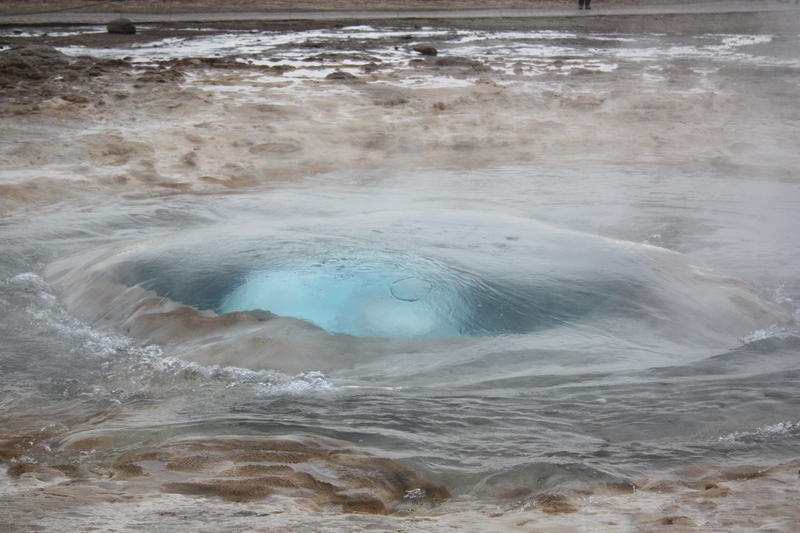 At nearby Haukadalur, the original geyser, Geysir, has long since given up erupting, but the plume of water that spurts from nearby Strokkur is impressive and conveniently frequent. The Alþingi, or parliament, met at Þingvellir from 930 to 1798 and thus the site is important culturally and historically in addition to its stunning physical characteristics. 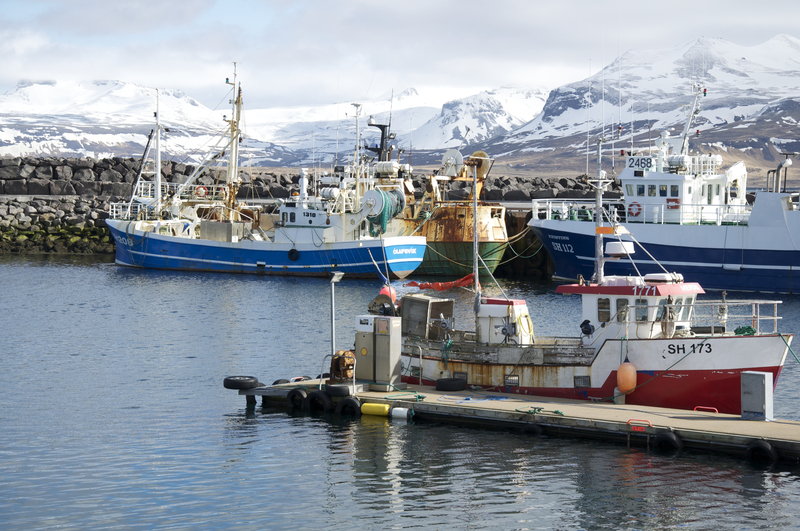 The three sites are usually combined into a morning or afternoon tour departing from Reykjavik, but it is worth spending more time at each than the tour allows. Take the southern ring road towards Vik and you will come across two impressive waterfalls. 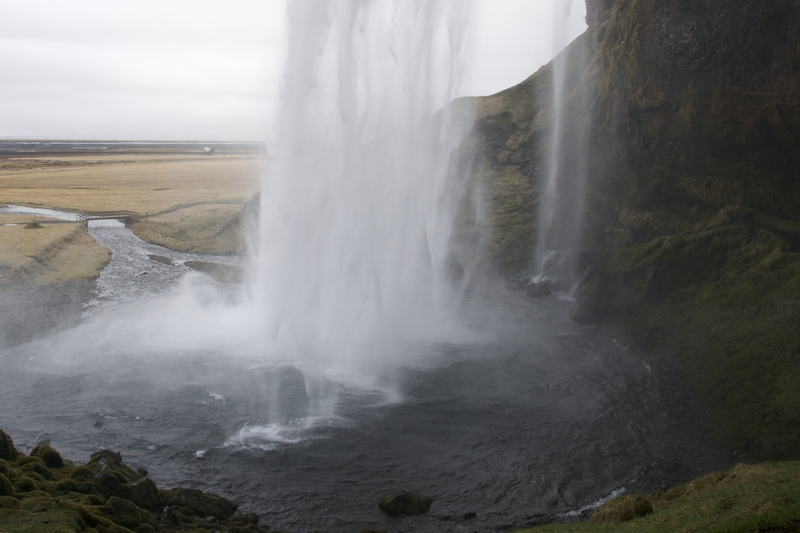 Skógafoss waterfall has an impressive 60 metre drop, but for sheer drama, my choice is the beautiful Seljalandsfoss waterfall. Climb up the wooden staircase to the right of the falls as you face them and the path takes you behind the curtain of water. You will get wet but it’s a lot of fun. If you’re fascinated by the eruption that created an ash cloud large enough to clear the skies of planes, then the Eyjafjallajökull visitor centre is a must. Discover the stories behind the eruption and the causes of one of nature’s most disruptive events. Find out more on their website: http://www.icelanderupts.is/ On a secluded ash-grey beach only accessible by 4×4 is the wreck of a plane. 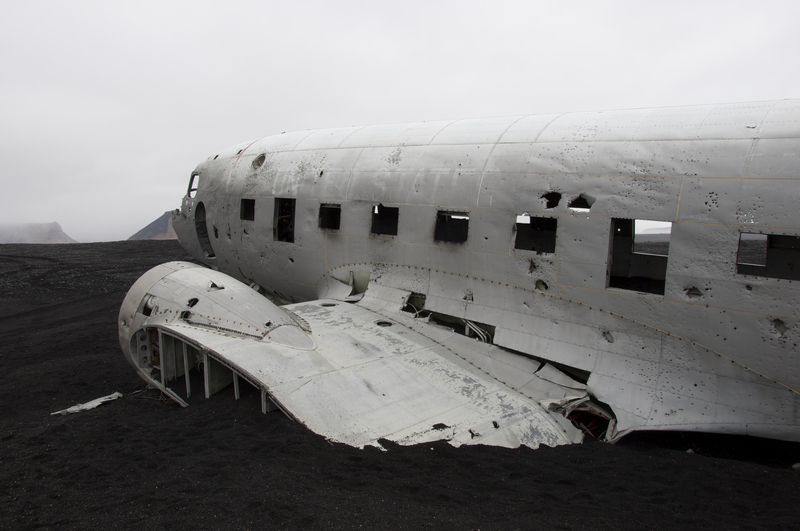 Near Vik, the DC3 crashed back in 1973 with no loss of life, and the plane has been there, abandoned, ever since. You can clamber inside (at your own risk!) or role play at being plane crash survivors à la “Lost” (though that was filmed in Hawaii, of course). 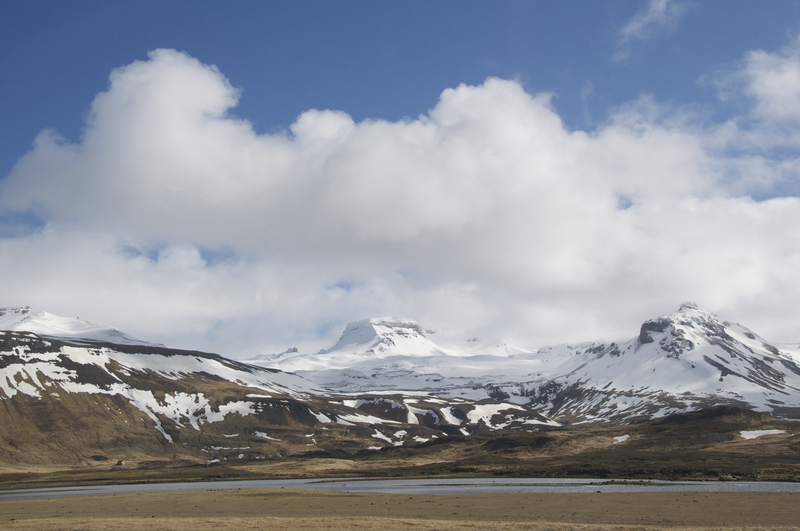 Situated on the edge of Vatnajökull National Park, itself a fun destination if you’d like to try out snowmobiling on Europe’s largest glacier, Jökulsárlón is a large glacial lake in the south west of Iceland. As the Breiðamerkurjökull calves into the lake, icebergs travel the short distance to the Atlantic Ocean where they bob about on the waves, washed on and off the beach until they finally melt. It’s a magical place; though the lagoon itself can get crowded, fewer people walk down to the beach which is a photographer’s dream. 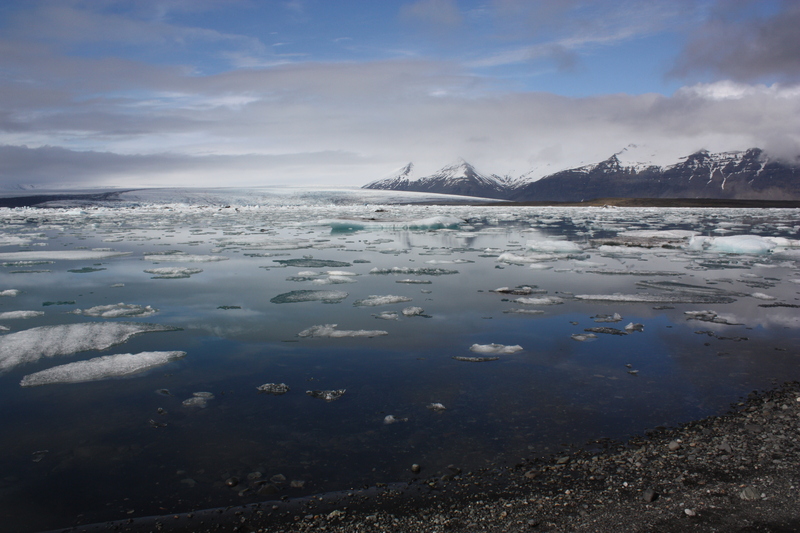 In summer, it’s possible to take a tour on an amphibious vehicle on the lake amidst the icebergs. 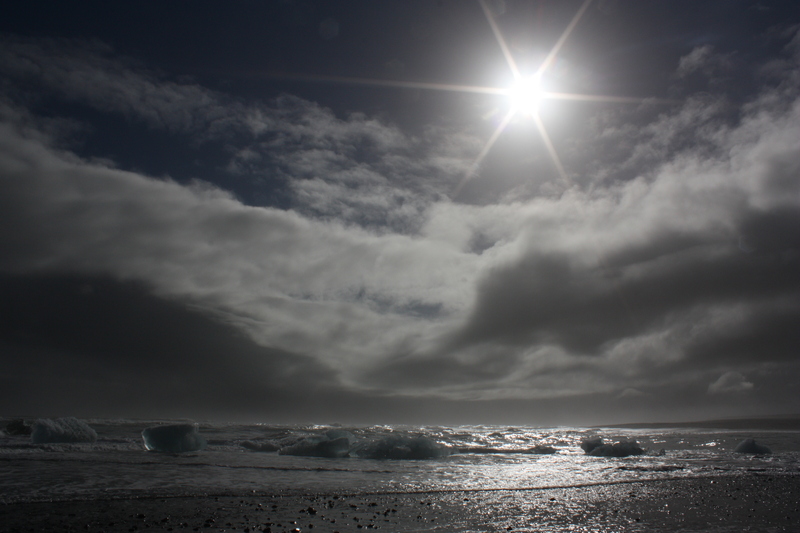 If you think you’ve heard of it before, you might have seen it in a movie; Jökulsárlón has been a setting for several Hollywood blockbusters, most famously the Bond film, Die Another Day.